Time Breath and Evidence is a multi-sensory sculptural installation that gives expression to the inescapable adventure of human mutuality. It begins as frontal torso casts of twelve American yogi. The plaster casts are gently highlighted with ritual colors from India, then waxed and are wall displayed on thick slabs of translucent plastic. 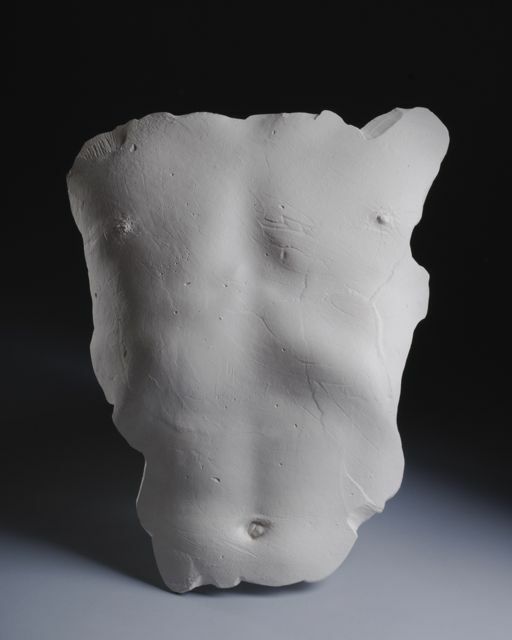 Each male and female sculpture, because of their nakendess, posturing, and artistic fashioning, exposes the inner body as well as individual vulnerability. As a grouping, they reveal a strong, common physicality and open the door to a way-of-being in the world that is neither digital nor scientific but humanistic.The choice of materials and presentation weave together ancient and modern, East and West. There is an accompanying audio narrative: breath, alone and ensemble, pulls together the movement of life through time and space, creating an aura of fullness and joy. A video loop of a ‘first breath’, as well as the a temple dance add to the experience. In the end the installation becomes the collective heart of an ongoing crisscrosss of lifetimes, cultures, and future generations. Why yoga ? Subject group is Yoga teachers. Yoga is a way of staying stable in relation to time. Something to return to: doing it and living it now; having done it as body goes through time and ages; yoga as everyone has been doing it, historically; yoga as it will continue to be done by future persons.